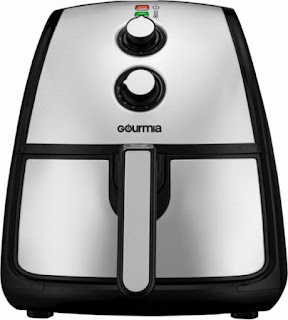 Check out this Gourmia - Hot Air Fryer $59.99 (Retail $119.99). Improve your fried food cooking process with this 5-quart Gourmia air fryer. It lets you prepare crisp fries or roast and bake favorites evenly with little or no oil thanks to its RadiVection 360-degree technology. The adjustable timer and temperature control of this Gourmia air fryer let you fry small or large quantities of food efficiently.